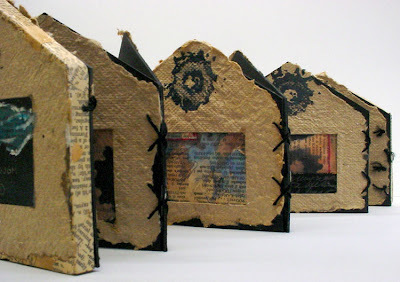 Dawn Wilson (creatively anew) of Boston Book Arts invites you to the exhibit SHELTER which is on view at the Wedeman Gallery at Lasell College in Newton , MA from April 11th to April 22nd. The public is cordially invited to attend the opening reception to be held on Thursday April 10th from 4pm to 7pm. Winners of The Hammond Real Estate Company and The Melville Charitable Trust cash awards as well as gift certificates from Charrette Corporation will be announced at the opening. The gallery is located in the Yamawaki Arts & Cultural Center at 49 Myrtle Avenue on the corner of Grove Street in Newton . The exhibit is free and open to the public Monday - Saturday 12 pm - 5 pm. SHELTER focuses attention on a universal subject and one of humanity's most basic needs – in all its manifestations: the home, the psychology of personal space, current issues in the housing market such as homelessness, the mortgage crisis and loss of historic fabric. 43 artists have been chosen to participate in SHELTER, an exhibition of artist's books juried by Janine Wong, faculty member in the College of Visual and Performing Arts at UMASS/Dartmouth. The SHELTER exhibition will travel to the following venues: Pyramid Atlantic Art Center in Silver Spring , MD , the Fleet Library at Rhode Island School of Design in Providence , RI , Montserrat College of Art in Beverly , MA and the String Gallery at Wells College in Aurora , NY . A 30% commission on sales from the exhibit will benefit a local housing charity.